Tānenuiarangi, the wharenui at Waipapa marae, University of Auckland. A modern wharenui at Te Papa Tongarewa, Wellington. 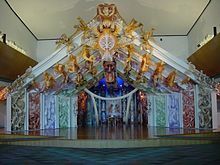 A wharenui ([ˈfaɾɛnʉ.i] literally "big house") is a communal house of the Māori people of New Zealand, generally situated as the focal point of a marae. Wharenui are usually called meeting houses in New Zealand English, or simply called whare (a more generic term simply referring to a house or building). 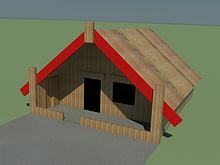 Also called a whare rūnanga ("meeting house") or whare whakairo (literally "carved house"), the present style of wharenui originated in the early to middle nineteenth century. The houses are often carved inside and out with stylized images of the iwi's (or tribe's) ancestors, with the style used for the carvings varying from tribe to tribe. Modern meeting houses are built to regular building standards. Photographs of recent ancestors may be used as well as carvings. The houses always have names, sometimes the name of a famous ancestor or sometimes a figure from Māori mythology. Some meeting houses are built where many Māori are present, even though it is not the location of a tribe; typically, a school or tertiary institution with many Māori students. While a meeting house is considered sacred, it is not a church or house of worship, but religious rituals may take place in front of or inside a meeting house. On most marae, no food may be taken into the meeting house. The maihi (the diagonal bargeboards) signify arms; the ends of the maihi are called raparapa, meaning "fingers"
The marae ātea comprises a very important open space directly in front of the wharenui, and is used to welcome visitors onto the marae. It also serves as an area on which to debate issues. Meeting houses are the centre of any cultural, business, or any affair which is relevant to the iwi as a whole. Typically, visitors to the village would be allowed to stay in the meeting house at night. Ceremonial occasions, including wedding and funeral typically take place in the meeting house or on the marae ātea in front of the house. Strict rules of conduct generally govern the use of the wharenui, which is considered the domain of unity and peace. If anyone should become irate or physically violent, they would be asked to leave the house until they can control their temper. ^ a b Māori Architecture - from fale to wharenui and beyond. North Shore: Penguin Group. 2009. pp. 52–53. ISBN 9780143011125. ^ "marae ātea". maoridictionary.co.nz. Retrieved 2012-04-20. Wikimedia Commons has media related to Māori meeting houses. This picture is the opening of Te Wheke Hall on December 30, 1901. The Field Museum of Natural History in Chicago, Illinois has an original Māori meeting house, called Ruatepupuke II as shown in this photo. The British Museum has a large collection of Māori art.